Pet-friendly inpatient drug and alcohol rehab centers put the emotional needs of their patients first. Rehab centers that allow pets provide added emotional support, a motivation to be responsible, and a companion to help aide in the stress of recovery. There are many benefits to having a pet nearby during addiction treatment. Finding the right pet-friendly rehab center is an important step towards healing and recovery. Some inpatient drug and alcohol rehab centers allow people to bring in a special companion, their dog. Dogs are called man’s best friend for a reason, and often provide relief from stress, depression, and trauma. Knowing dog-friendly drug and alcohol rehabs exist can offer hope for a person suffering from addiction and in need of help. Drugs and alcohol have been around for a longtime, and so have dogs. Research shows that owning a dog is very meaningful for people, especially when they’re struggling through hardships or emotional trauma, like drug or alcohol addiction. Drug and alcohol rehab centers aim to change a person’s thinking, behavior, and attitude towards drugs or alcohol. The rehabilitation process can be emotionally straining, and having a dog nearby can help deal with the powerful emotions that come with recovery. Dogs can offer a sense of loving, caring, and support that is essential to both rehabilitation, and the lifelong process of managing addiction. Allowing dogs in drug or alcohol rehab centers is gaining traction in the world of rehabilitation. Pet-friendly drug and alcohol rehab centers are likely to focus on issues like relationships, responsibility, and productivity within the community. If a dog is not a person’s pet of choice, many rehab centers may allow cats as another effective companion for healing and recovery. Petting, stroking, or cuddling with a cat can have a positive effect on a person’s health and well-being. Research shows that cats and other pets create feelings of happiness in their human counterparts. Pet-friendly drug and alcohol rehabs may allow cats to help a person cope with the pressures of entering treatment. Millions of cats are given to animal shelters each year. A cat-friendly drug and alcohol rehab center is likely to allow a person to continue caring for the pet, instead of being forced to give it away. If a person is suffering from drug or alcohol addiction, then owning a cat may be the one source of unconditional companionship in their lives. People addicted to drugs or alcohol are likely to act in ways that are harmful to themselves or others, and petting a cat, or listening to it purr, may provide comfort in ways that other humans cannot. Cat-friendly drug and alcohol rehabs may allow a person to bring a cat, but time with a cat may be restricted. While a cat can be productive for stress management, health, and emotional well-being, the ultimate goal of drug or alcohol rehab is to stop using drugs or alcohol, and to learn how to live a balanced and productive life. Some rehab centers won’t allow an individual to bring a personal cat or dog, but may provide therapy dogs to help deal with mental health issues, and the emotional challenges of dealing with addiction. Mental health disorders and drug or alcohol addiction are a challenge for public health and safety. Therapy dogs are used to help individuals that suffer from these issues, and some rehab centers may provide therapy dogs as a means of assistance and support. A dog handler may work at the facility and bring the therapy dog from room to room. The person suffering from drug or alcohol addiction is likely to smile, feel happy, and improve their mood once they interact with the dog. This can enhance a person’s spirits and engagement in drug or alcohol addiction treatment, which is vital to recovery and success. Addiction is a long-term brain disease that requires care, occasional medical attention, and other services in order to effectively treat. Many healthcare and rehab centers are beginning to realize the helpfulness of dogs or other pets while receiving treatment for mental health disorders or drug or alcohol addiction. Rehab centers that have therapy dogs offer animal companionship by providing dogs that are trained to be compassionate. However, spending time with normal pets during addiction treatment can be beneficial for individuals struggling with drug or alcohol abuse. During addiction treatment, a person is likely going through one of the most emotionally draining experiences of their of life. It could be beneficial to have a pet around to lift a person’s mood when treatment gets tough. Drug or alcohol addiction can also be traumatic, and interacting with dogs and other pets have shown to reduce painful feelings caused by trauma. A person suffering from trauma brought on by drug or alcohol addiction may find solace during the process of recovery when they care for their dog or give it commands. Comfort dogs or emotional support animals are likely to be very helpful during the rehabilitation process. These are typically regular pets, and bringing one to a pet-friendly drug or alcohol rehab center can add consistent and reliable companionship, as well as increased happiness, to someone striving to overcome addiction. The following is a list of the top drug and alcohol rehab centers that allow pets in the United States. For more information on what program is right for you, contact us today. Taylor Recovery encourages people to bring their own pets during treatment. 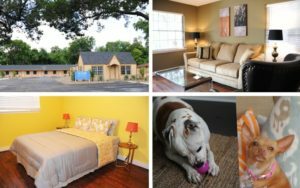 They focus on “Houston Sober Living,” and believe owning and caring for a pet is a great way to achieve a balanced, productive, and sober life. KLEAN Treatment Centers have seven locations spread over 3 different states, but always allow dogs at their West Hollywood location. They believe an individual can use a canine friend during recovery, and help aide a person during the healing process. The dog is allowed to stay in the person’s room, providing companionship, emotional support, and responsibility. Be sure to bring a dog leash, medical records, water bowl, treats, toys, and grooming supplies. Located in a beautiful seaside resort city south of Los Angeles, Capo By The Sea offers drug and alcohol treatment programs that understand how much pets mean to people. Staffed by self-proclaimed animal lovers, this facility is glad to make any arrangement necessary for a person to bring their dog or cat to help provide support and happiness during recovery. Although pets are only allowed on a case by case basis, this treatment center cares about people’s relationships with pets, and wants to offer a person the best care and comfort to overcome addiction. The Hills Treatment Center offers a Pet Therapy Program to help with emotional support during drug rehabilitation. Here, they offer a variety of programs and treatment options to deal with substance abuse and addiction. The treatment facility understands the psychological benefits of having a pet nearby, and, depending on the individual, will allow people to bring their own pets in. Cliffside Malibu is a luxury drug and alcohol addiction treatment center situated on the Pacific ocean, and features hiking and other therapeutic activities to help with recovery. They allow people to bring pets and will decide on an individual basis. A person can bring a pet if staff deem it to be productive during recovery. If you are ready to get help for an addiction to drugs or alcohol and are worried about finding a rehab center that accepts pets near you, contact us today. No matter your financial situation, we will help find a solution that works for both you and your furry friend. *** OpioidTreatment.net is not affiliated with any of the treatment centers listed on this page. This article was put together as a resource for individuals looking to get treatment that have pets.